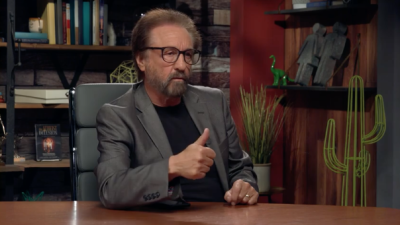 Apologist Ray Comfort is known for his creative approach to sharing the gospel. Comfort, who founded the Living Waters ministry, regularly creates documentaries and other outreach projects aimed at reaching people with biblical truth. But the well-known apologist wasn’t always the Bible-believing man he is today. In recent years, Comfort has produced and hosted films like “180,” “Noah and the Last Days,” “Audacity” and his new project “7 Reasons” — movies that lead people to think deeper about faith, the world around them and God’s love. He recently spoke with PureFlix.com’s “Pure Talk” about what he believes is the biggest barrier that prevents people from embracing God and the Bible. The apologist will join Answers in Genesis founder Ken Ham, among many others, in addressing key questions about faith, atheism and how to engage with non-believers. Comfort will also preach at a sunrise service on Easter morning at the Ark Encounter, leading in a celebration of the resurrection of Jesus Christ. He also shared details on his own upbringing and spiritual journey, explaining that he grew up in New Zealand in a non-Christian household and didn’t find God until he was an adult. At age of 20, Comfort was married, had a home and had already built a successful business, accomplishing most of his goals early on — a scenario that left him with a uniquely early “midlife crisis” of sorts. Some deeper thoughts about life and meaning soon shocked him out of spiritual apathy. In fact, everything changed for Comfort one night when he was sitting in bed next to his wife and he came to a terrifying realization. Comfort was on a surfing trip and another guy shared the gospel with him. Suddenly, everything became clear and his purpose and understanding were transformed. So, Comfort said he decided to become a Christian. Almost immediately, he was sharing his faith with the masses — something he continues to do here in America decades later. One of Comfort’s motivators is that he is “horrified” at the thought of what happens to those who reject Christ. With that in mind, he seeks to bring the gospel to others in an effort to yield understanding and to build bridges to God. Want to see Comfort share his views on faith and atheism in person? You’re invited to attend the Answering Atheists conference this April. You can learn more here.